Can we have a pets section? 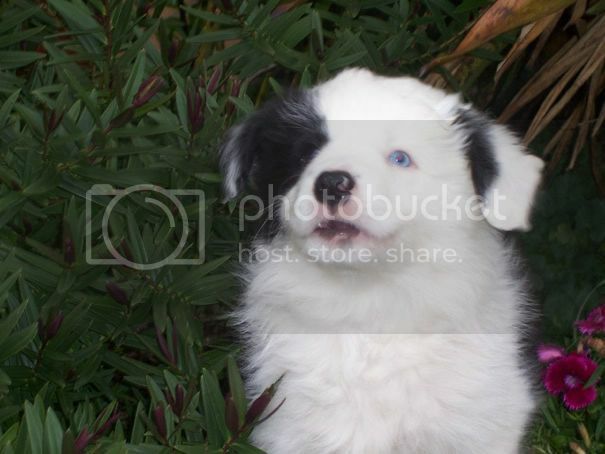 Here are some photos of my new border collie puppy. Actually, I only took one of these photos (her lying in the grass), but I like the other two because you can see her mismatched eyes. Oh, and she's not as innocent as she looks, I've got lots of fang marks in my arm! But I still love the little hairball. Hope I made these thumbnails correctly, too. Indi is gorgeous. 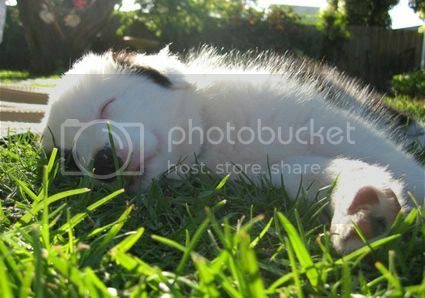 Ooooohhh I just love border collies. Here was our delinquent when she was a pup. Will post recent pix later. Click on thumbnail to see Panda and Banjo. This is my dog Mickey, he is a half pug half terrier, and he sometimes thinks he is a cat!!! Although sometimes you could swear that there is a human inside him with all the facial expressions he pulls! my dog that lives with the parents in gladstone. Does she need a lot of grooming? I'm wondering how hairy my pup is going to be when she grows up, she already has a pretty thick coat of fuzz. How did that dog manage that?! He is a cutie though. Love the Piccie of little Panda and Indi, is absolutely adorable!!! 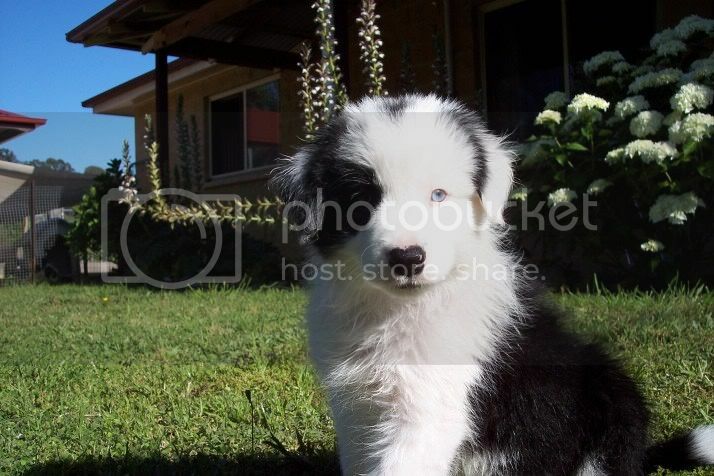 I think I may get a border collie pup for my next dog!!!! Grooming is not too bad with borders. Panda has very soft fur around the ears which tend to knot up a lot. Get the pup used to brushing etc very early. Particularly the tail and back of legs. Then there should be no problems. We would only ever have 2 borders together (if space permits). They make great companions to each other and tend to keep out of mischief more. Hey Michael, just love the antics of your dog! And Mickey sure look mischievious enough to really get into lots of trouble! yea thats pretty much how he escapes the house. parents have tried evrything to keep him in but he ends up jumping over that fence to the ground with is a good meter and half. hurts himself all the time. i think hes scared of the wind and likes the shelter from it round the front of the house..
Mickey is very mishievious!!! And spoilt rotten. He will do anything to run like mad out the front door to chase cars and will do anything to get what he wants. Michael, my dog would not even be able to jump up on the thing, let alone keep the balance to climb it! Very smart dog. I wish I could have two border collies! But, there is always someone home at my house so Miss. Indi is never by herself. We're also going to puppy kinder, and after that, obedience and agility. Mickey is a little sausage, I love him! And Hammer- I've never seen a dog do tightrope before. He looks really impressed with himself up there too. I have to say that i have a lot of animals i have cats,dogs,bird,rabbit, and soon a fish. 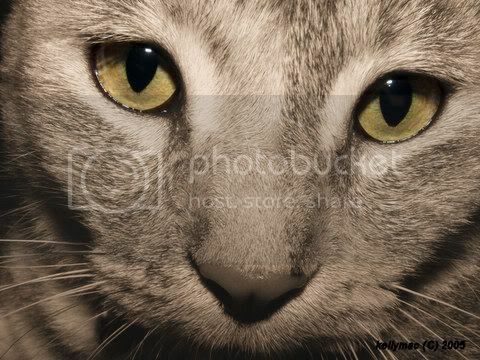 Have in cats all males have 2 tabbies, 1 prure white with blue eyes, have 1 long hair pursian and 1 simese. in dogs have 3 alaskian malamutes 1 silky x maltese and 1 blue cattle. in fish dont know yet it is for xmas for son. Hi everyone! Love the pictures of the Border Collies and the tightrope dog, that made me laugh! We have 2 cats, who I firmly believe think they are human. 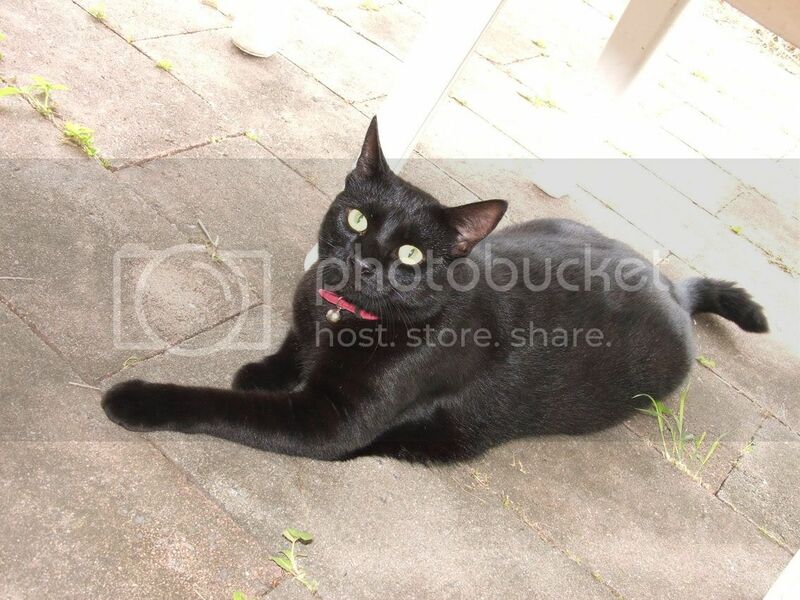 This is our cat Bevo, 20 months old and possibly the best behaved cat I've ever owned. We adopted him from the Sydney Dogs Home the day before he was due to be put down. Mango\'s Dairy . Hasn't been updated in a while though. Us pet owners get to live longer! Great to see all ya animals people. My cat who has one hell of a story.. Not enough space to tell it here. Nothing relaxes like a cat.. I thought i would bring this thread back to life seing as though i bought my fiancee a couple of pet lop eared rabbits yesterday!! Her name is fluffy !! Just gorgeous Rob! I had a grey rabbit 'Metro' (don't ask! ), and he was fabulous! I toilet trained him to go in a kitty litter tray in his hutch, and on hot days he would stay inside the house, hop over to the back door when he needed to 'go', would do it in the compost heap and then come back inside again...smart rabbit. He would love to sit on my lap and be scratched behind the ears, and got on well with the cats and dog! They make great pets, and a wise choice with 2 females!! Tango (aka TornadoChaserDog) who at 20 weeks old already has 1,000 stormchasing kms under his belt and has travelled in 3 states (SA, Vic, NSW) is going through the seriously cute puppy stage..... anyone coming to the ASWA Victorian barbeque on the 25th February at Mt Macedon can catch up with him..
Wow Jane!!! I can't believe how much Tango has grown... amazing and just so very cute. My little Jilly-Bean has just turned 9 months old and runs the household with military precision... we get "told" when things don't get done when they're supposed to. Generated in 0.016 seconds in which 0.003 seconds were spent on a total of 12 queries. Zlib compression disabled.